AUniversityofUlsteracademic database with comprehensive details of hundreds of memorials relating to the Troubles has been transformed into an interactive iPhone app. 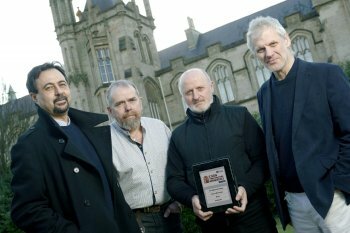 The Memorials App project was led by staff at INCORE (International Conflict Research Institute) which is based on the University's Magee campus and has links to the United Nations University. The app will make information about the Troubles easily accessible, widely available and invaluable as an educational resource. The Memorials App forms part of theCAIN(Conflict Archive on the INternet) Web site. CAIN has been collated over a fifteen-year period by a team led by Dr Martin Melaugh, Research Fellow with INCORE. Dr Melaugh explained the CAIN Web site contains anextensive range of information and source material on the conflict and politics ofNorthern Irelandfrom 1968 to the present day and is used by academics worldwide. “This easy to use iPhone app was will allow users to view information and photographs about each plaque, memorial stone, memorial enclosure, garden, or statue that has been erected to commemorate conflict-related deaths," he said. The memorial information was first made available via the CAIN Web site back in June 2009 but the Memorials App offers a new way to access this material. "Memorials inNorthern Irelandare still evolving and the app has a facility which allows users to send us new information to update our database. We would welcome contributions of photographs of any new memorials, as well as information on changes to existing memorials,” Dr Melaugh added. Professor Brandon Hamber, Director of INCORE, said: “We are always looking at different ways to make the information on the CAIN Web site more accessible to a wider audience. “The Memorials iPhone App is just the start. We would hope to make the same information available for other smartphones that use different operating systems like Android, Blackberry and Windows Phones. “We want to enable as many users as possible to engage with the information when they visiting the memorials to make the information more interesting and relevant for them. “However, further development of the App will be dependent on funding. We are currently looking for potential funders to develop this project further, as well as other mobile applications based on CAIN so we can make contemporary and historical information on the conflict truly mobile and accessible,” added Professor Hamber. EyeSpyFX which is supported by the university’s Office of Innovation, was founded in 2002 by Anthony Hutton, a senior lecturer in theSchoolofCreative Artsat Magee App.EyeSpyFX has deep expertise in mobile App development, database and m2m technologies. In 2010, it launched an iPadApp, ‘Ireland; Myths and Legends’ and was one of the firstIrish companies to develop an app for the iPad.Anthony Hutton said it was great to work on the Memorials App project because the database was so complete. Mr Tim Brundle, Director of the Office of Innovation said the Memorials App would advance our understanding of history in a new and immersive way. Technical development support was provided by Mike McCool, ICT Director for INCORE and CAIN. Development work on the Memorials App was funded by the Research Branch of the Office of the First Minster and Deputy First Minister (OFMDFM). Caption (from left to right) Professor Brandon Hamber, Mike McCool, Dr Martin Melaugh and Anton Hutton.